Garstang Canoe & Kayak Club, located between Preston and Lancaster, was founded at the town’s Tithe Barn pub in 1973; originally part of the Scout group. The club is small and friendly and caters mainly for river running and playboating kayak paddlers, but welcomes open boats and sea kayaks too. 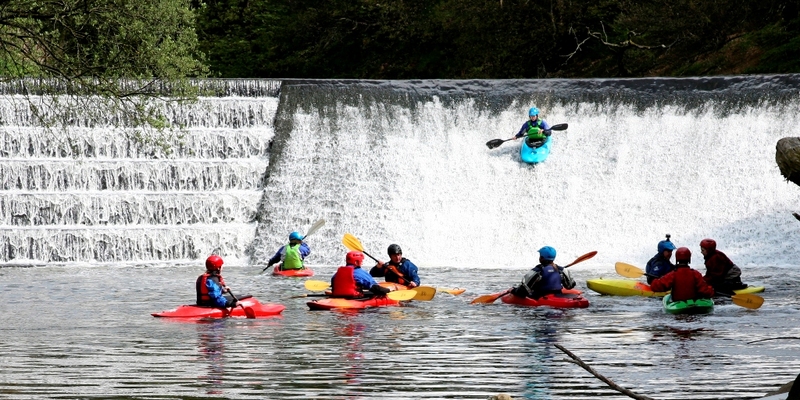 The club is fortunate to have access to the river Wyre in Garstang, with easy access a stretch of water perfect for training and a weir for practicing moving water paddle skills. We meet at 6.15pm each Wednesday from April to September, aiming to be on the water from 7-8pm depending on river levels and available daylight. Please check our Facebook page for safety updates if there has been heavy rain in the run up to a session. The club will provide you with a boat, paddle, spray deck, helmet, buoyancy aid and a flipping good time. The club has British Canoeing Level 1 and Level 2 accredited instructors so you can rest assured that you're in good hands. There is always someone to help and advise either the complete novice, or paddlers who just want to join a club with a friendly family atmosphere. Membership is £30/year (Discounts available for junior and joint membership), but you can come and try before you commit. Weekday sessions are £10 for non members, £6 for members.